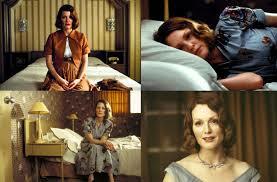 If you saw the 2002 film, The Hours (with Nicole Kidman, Meryl Streep, Julianne Moore, Ed Harris, Claire Danes and Toni Colette), you may recall the scene where Laura, the 1950’s pregnant housewife played by Julianne Moore, checks herself into a hotel room with the intent to commit suicide because she is desperately unhappy as a wife and mother. But when Laura lays down on the bed and dozes off, she dreams there is water rapidly rising from the floor of her hotel room and if she doesn’t wake up, she’ll drown. So she wakes up and realizes that she doesn’t want to die. Rather, she wants to end the life she’s living…the one she chose because it was expected of her. She leaves the hotel room and returns to her husband and young son but only stays with them until the baby is born. Then she walks away from her family and starts a new life…alone. In other words, if Laura had to choose between killing herself or continuing with a life that was killing her spirit, she would have chosen physical death. Instead, she chose a third option: leave the life she’d started but hated, so as to live the life she wanted – and let the chips fall where they may. I suspect many people can’t comprehend Laura’s decision. It is unfathomable – and unforgiveable – to walk away from one’s family, especially when a child is old enough to remember you. But self-preservation can be a very powerful force. Freedom can trump responsibility. I’m not condoning Laura’s decision but I do understand it. Because to me, motherhood would have meant the loss of my freedom…to do what I want, when I want, with who I want. For me, motherhood would likely have meant the death of my dream of becoming a writer – and that was not a risk I was willing to take. I was not prepared to make the compromises required to take both paths. So perhaps the metaphor of drowning is perfect – for if one is not fully in the game of motherhood, the constant demands of raising a family while trying to achieve other goals would feel like drowning…except you don’t actually die. You just try and keep your head above water and hope that by the time you reach shore – i.e. your kids grow up – you’ll still have the time, energy, money, passion and support to do some of the other things you really want to do. I love children and genuinely enjoy spending time with them – in small doses. But that is very different to being a parent. And the older I get, the more I realize just how significant this difference is. Since I’m really only interested in the fun and educational portion of the parenting program, I make a far better Auntie than a Mom. As a writer, I am fortunate to have the opportunity to share my personal experience with other women who may be on the fence regarding the motherhood decision. I write with candour on the subject not because I particularly enjoy revealing uncomfortable truths about myself 🙁 but because the decision to raise a child is not reversible. You can’t return kids. At this point of our evolution, the planet doesn’t need more children. What the planet needs are people who genuinely want to raise children – and are willing and able to take on all the responsibilities associated with that. Although the vast majority of women don’t walk away from their family if they end up regretting their decision to have a child, I suspect some do walk away emotionally and/or psychologically during the challenging times. They may be physically present to parent but their heart and soul aren’t in the game. And that is heartbreaking – but not surprising. An earlier scene (prior to the hotel scene) in The Hours captured this beautifully. Laura’s little boy knew his Mom was desperately unhappy – and the emotional stress this caused him was heart-wrenching. Laura had left her family long before she physically walked out the door. As such, I think a film such as The Hours can be a powerful teacher because when it comes to one of the most important decisions a woman will make in her lifetime, it is far better to learn through the mistakes of fictional characters than it is to gamble with real human lives. Women like the character Laura in THE HOURS, are the most selfish human beings, in my opinion. It would have been less selfish not to become pregnant in the first place. But once a woman does become pregnant, she has an obligation to put that child’s needs above hers, until the child become an adult. Or, if that child has some disability the mother should be putting that child first for the rest of her life. Her dreams and aspirations can take other forms, and can be fulfilled in the same ways, if not necessarily in the same time frame. No child ASKS to be brought into the world. There are situations where a woman does better for the child to give it up for adoption, place the child in a place where they can get the best care if there are handicaps….but to walk away because it is not the life that woman had envisioned and planned for herself? SELFISH. I know you’re not advocating women do as this fictitious character did, Maryanne, and I’m sure you would have been a wonderful mother had you become pregnant in the past. But I have no sympathy for women like this character. And on that note, the same for the many sperm donors who do not take care of their children because they feel it is the mother’s responsibility. SELFISH! Get over yourself. Hi Sherelle…thank you so much for your candid feedback! You convey your opinion and points on the matter very clearly and I really appreciate you taking the time to write down your thoughts on the blog – and in particular, the decision made by the fictional character, Laura, in the film, The Hours.